At this point in the year, I look at my car in disgust. Between the typical signs of kid occupation with the crushed goldfish, sticky seats from spilt juice and the fuzzy ball of you-are-not-sure-what-that-was, the car can look like a frat party in a matter of days. Then add the post-snow-apolyse of salt, mud and sand, it looks like the family SUV was in a monster truck rally. 1. Check sites like Groupon for car detailing deals. Those detailing companies know that our cars went through a lot this winter and they want your business, and ofter discounts and coupons as a result. You want your car cleaned. So win-win for all. 2. Get your car washed and take advantage of the extra services there. Typically outside the auto-wash, there is an area to vacuum, towels to wipe things down, and big trash cans. Since the days are getting warmer, spend 20 minutes utilizing the tools and vacuum your car and clean it out. 3. If you need to 100% need to DIY it, but it seems daunting, then tackle one problem at a time. Spend one day vacuuming. The next, wipe down the car’s interior with Vinyl Cleaning Wipes . The last day, wash and wax the car. 4. Once the car is clean inside and out, get some tools to keep it cleaner longer. These are some of my favorite car organizers, like the Munchkin Backseat Organizer , Car Storage Bucket , or the Super Seat Saver Mat that can keep your seats clean and even has pockets for storage for the front seat or backseat! The kids (and you) have a place to store stuff. It is much easier to clean out these containers and mats from time to time, instead of the whole car. I also love WeatherTech liners for the floors. When they get really dirty, just hose them down. 5. Don’t forget the trunk of your car or SUV. Give that a good clean and consider a WeatherTech liner for that area too. Then stock up on supplies to store in the trunk like a bottle of water, blanket, and first aid kit. Then schedule a reminder in your phone to check on those items every three months (around the change of each season) and replace expired products. 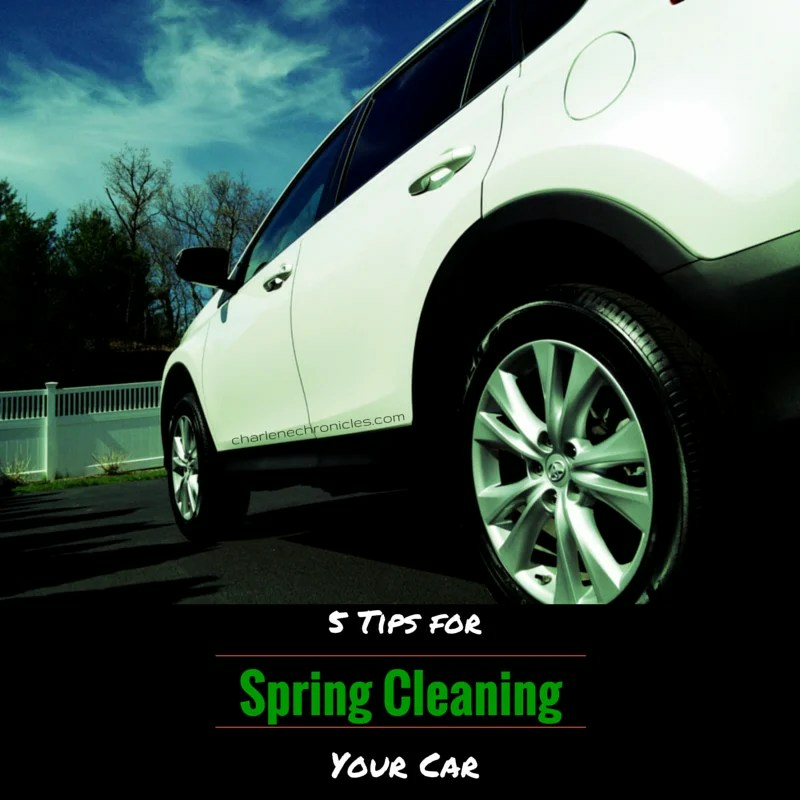 These are my five tips for spring cleaning your car. Do you have any to add? Ugh! The car cleaning does seem daunting- group-on detailing is a great idea! I mean, just how many goldfish can one kid mush into a car seat? Add in months of spilled juice and sand, and it is indeed a daunting task. Glad to hear that I’m not the only one fretting about this!